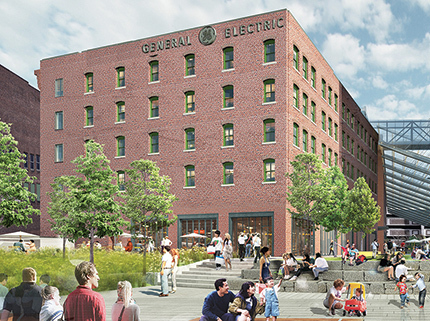 Since deciding to move their headquarters to Boston two years ago, General Electric (GE) has been operating from an interim headquarters on Farnsworth St. in Boston, while the company completes a full renovation and rehabilitation of two brick buildings in Boston’s Fort Point neighborhood. Built in 1907, the two Necco Court buildings are historic brick-and-beam structures that once housed the New England Confectionery Company (NECCO). With a combined square footage of 110,000 s/f, the two brick buildings have seating for up to 280 people. The upper levels will host GE offices and approximately 75% of the ground floor will be open for public use, including a waterfront bistro. In May 2017, GE kicked off the project by selecting Consigli Construction Co. as construction manager and AECOM, as the owner’s project manager, to assist with the coordination and renovation of the two six-story, historical buildings. Lynnwell Associates, Inc. (Lynnwell), a commercial electrical contracting firm based in Quincy, was selected as the successful subcontractor and was engaged to complete the electrical, fire alarm, telecommunications and security upgrade of the building. Since being awarded the contract by Consigli in early 2018, Lynnwell has been on-site at the Necco St. buildings assisting with the coordination of the build out with the construction design team. Using 3D coordination tools including AutoDesk and Trimble, Lynnwell’s innovative tactics ensure precision and accuracy as the project progresses. “The 3D Building Modeling coordination of the GE project underscores our dedication to innovation in the construction industry and emulates the cutting-edge nature of GE as a company,” said Mahoney. The renovation project is being delivered in two concurrent phases. Phase one involves the design and construction of the core and shell of the buildings including their structure, cladding, base plant, and completed common areas and external works. As part of this phase, Lynnwell’s I.B.E.W. union electricians are installing a new electrical distribution system, new utility transformer, roof top generator, general power, emergency power, UPS, fire alarm system, security system, and lighting with lighting control for the interior and exterior of the building. As the project progresses, Lynnwell will continue to work collaboratively with Consigli, AECOM, and the rest of the construction team to ensure that the renovation is delivered in the most efficient manner. 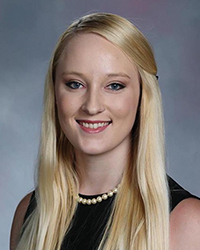 Samantha McPhall is a marketing consultant for Lynnwell Associates, Inc., Quincy, Mass.